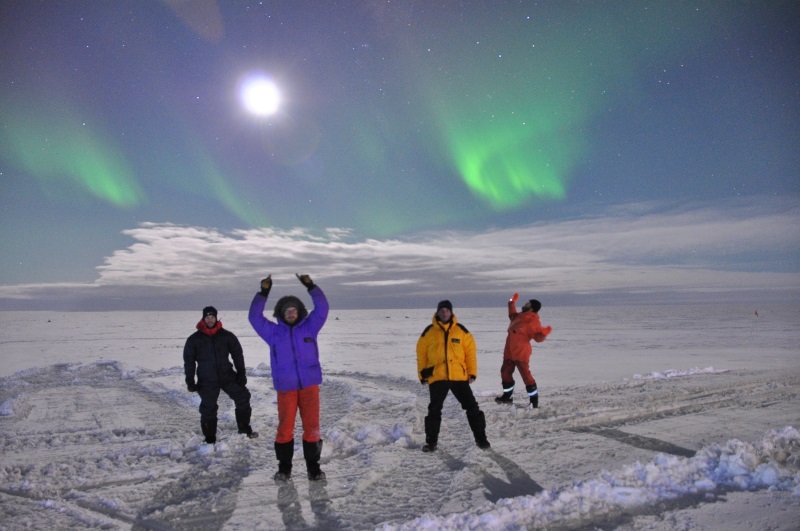 So, here am I and 11 others, sitting on the ice shelf, living it up. Apart from satisfying the various extremophilic/civilophobic tendencies of the team, why are we here? It’s not a great place to be. Humans aren’t supposed to be here – something the environment reminds us of frequently enough. Well, there are two purposes. First, we represent the UK on the continent. Second, we’re a scientific station. Today, I’ll outline some of the stuff we do here. Halley is described as a “data factory”. We collect data but we don’t analyse it – no papers get written here. We send our data back to HQ in Cambridge and academic institutes around the world where much more sensible people can ponder over it right after a pleasant picnic under a tree. The data we gather is predominantly of the atmosphere and low space environment. 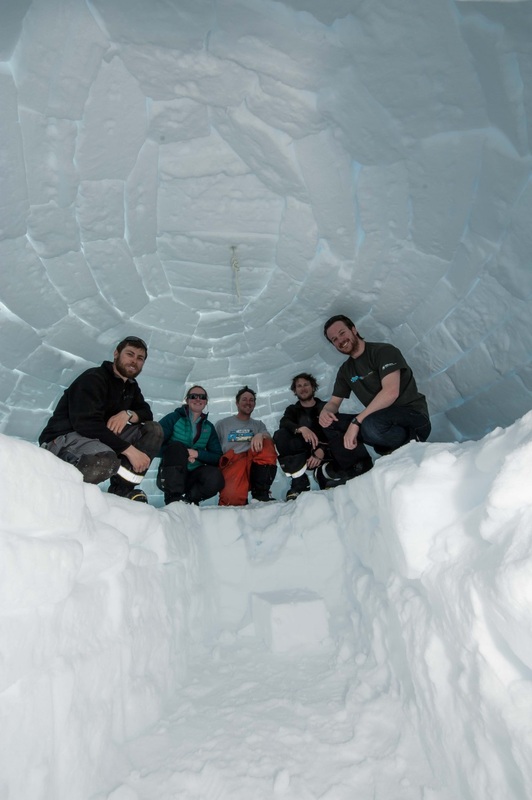 This is important for global climatic research – long-term, planet-spanning atmospheric changes are heavily driven by the behaviour of stratosphere. 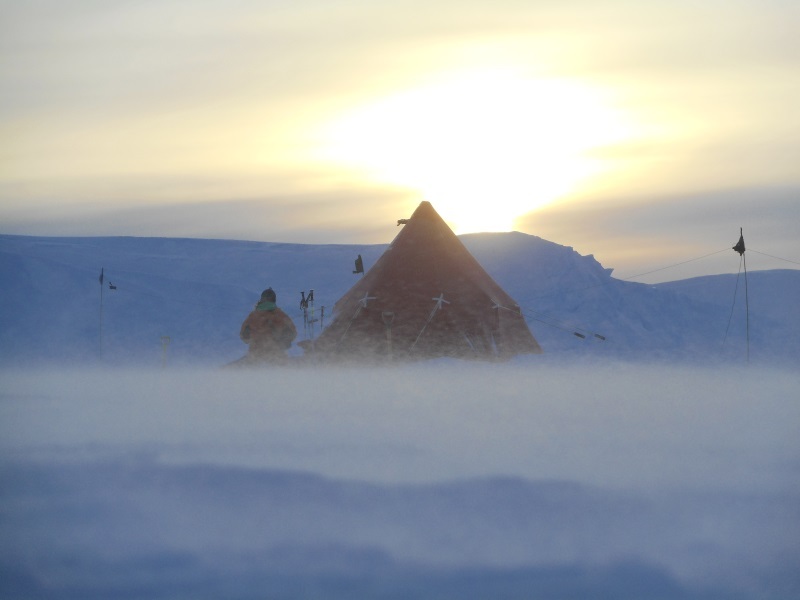 The polar region is both a “clean” environment free of local human or natural effects, and where global atmospheric trends tend to be amplified. It’s also a very underobserved area, with only a few observation stations over the whole continent. So, what do we do to monitor the sky? First off – the cameras! Next up, we have the radars. these are the biggest and most photogenic objects on the base. We have the Medium-Frequency radar, which is made of 12 20m dipole antennae blasting 120kW of power straight up and seeing what comes back. 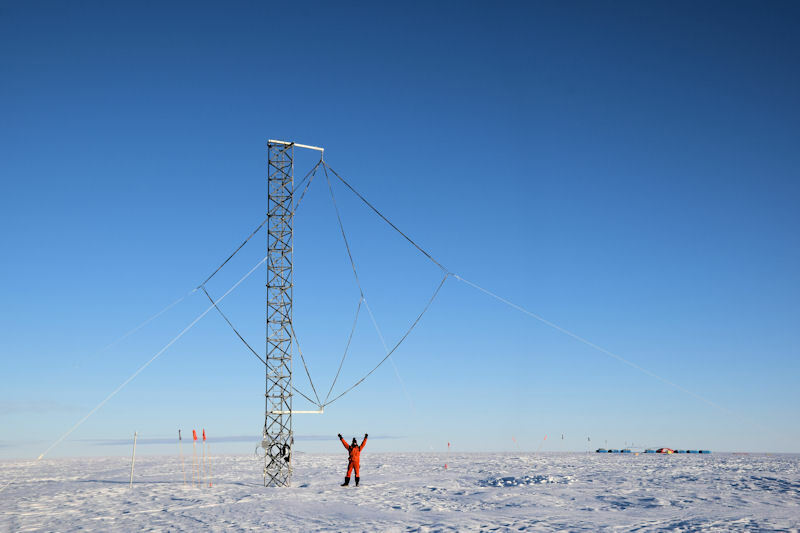 The other is SuperDARN – one of a large network across Antarctica – which beams its power at sideways, with signals travelling up to 3500km. Both radars sees reflections from the charged particles in the ionosphere and, from these reflections, the shape of the ionosphere can be reconstructed. The movement of air in the upper atmosphere can be tracked and the distribution of the sun’s energy can be found. My colleague Dave looks after all of that most of the time. My biggest job here is looking after the Microwave Radiometer. 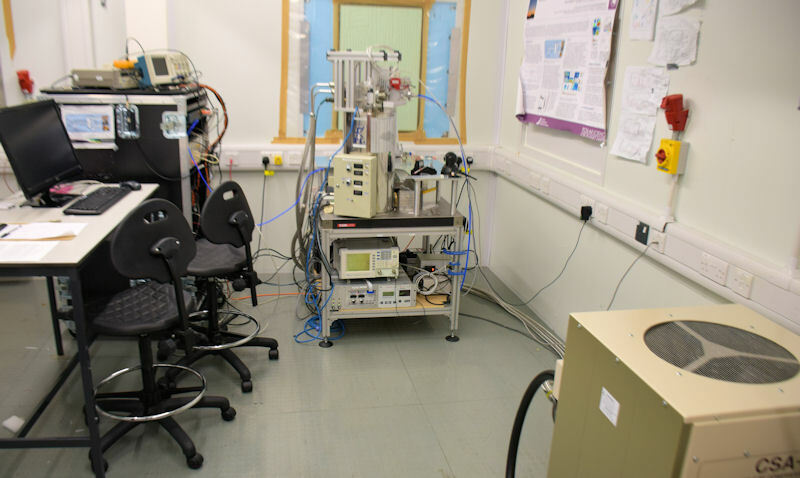 This is a neat piece of kit – it detects ultra-weak emissions of various molecules in high atmosphere by looking at the radio spectra around 230GHz and 250GHz. These molecules emit minuscule amounts of energy, but they do so at very specific frequencies. 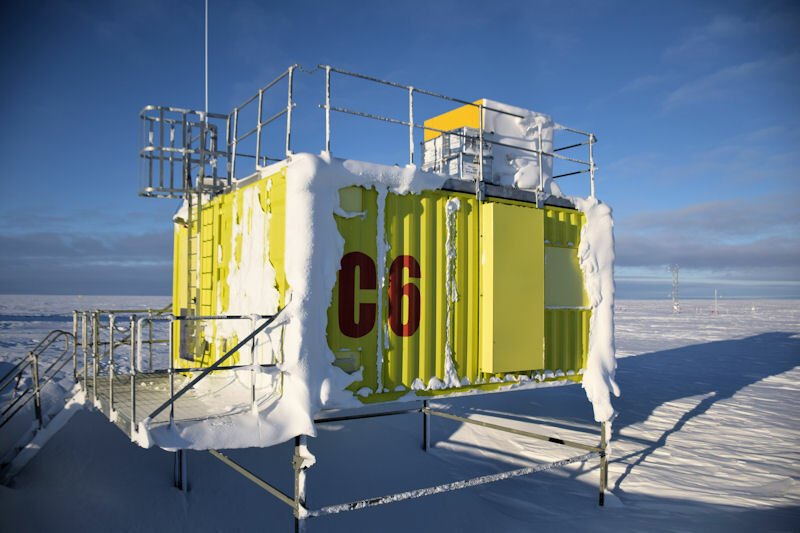 Using a cryogenic chamber to cool a superconducting detector to under 4 degrees above absolute zero (that’s a nippy -269C), these signals can be found and amplified. By looking at the intensity of these faint signals and their bandwidth, we can determine how much there is and how high it is. 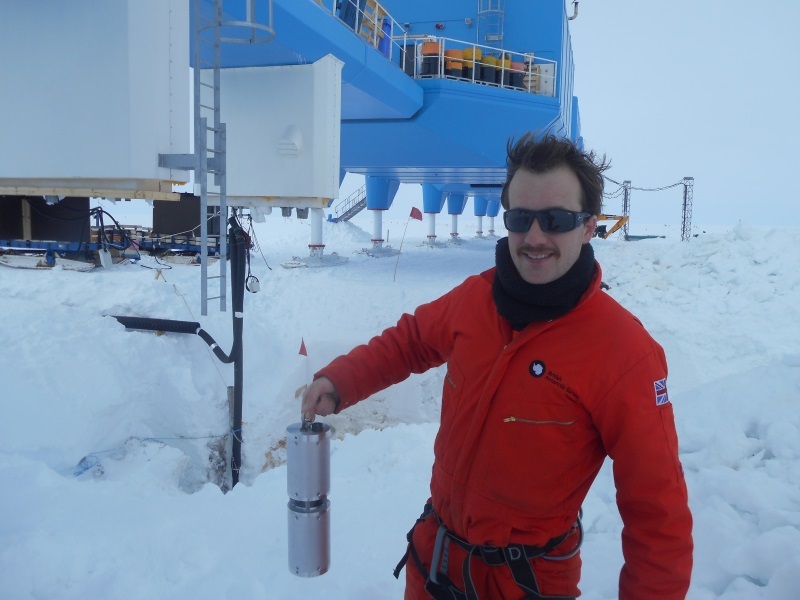 We’re looking for ozone, carbon monoxide, peroxide and the particularly elusive nitrous oxide as these guys are particularly important in atmospheric processes. The other major experiments I look after are the ones in the Electromagnetic Quiet Area. 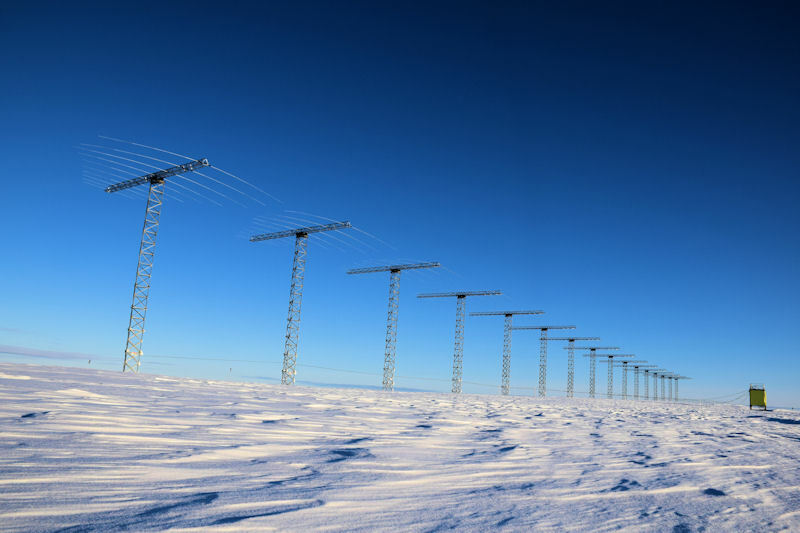 These are the opposite of the electromagnetically loud, powerful antennas – these are receivers quietly listening for radiowaves that give us hints in to what the sky is doing. Accordingly, it’s placed way away from the radars to prevent interference. These instruments are so quiet that they can detect the movement of a speaker in a radio, or even someone walking past them. There are several instruments in this area. First up, we have the riometers – simple upwards-facing 30MHz antennas listening to celestial noise, and watching how it is attenuated by atmospheric effects. Then we have the magnetometers – one of which is in a 10m deep tunnel (which is kinda cool to go down!). There’s more things as well, but they’re the main things. 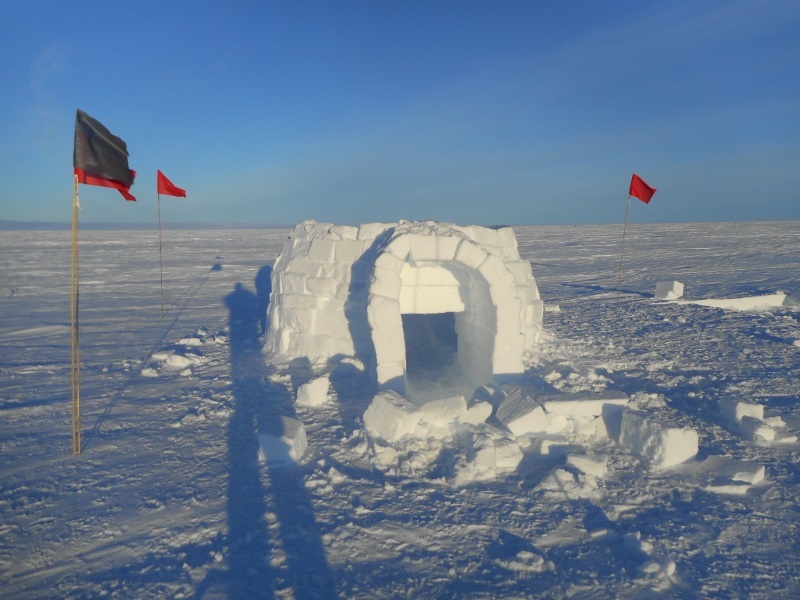 In the summer, we’ll fly out to field sites all over Antarctica to checkup and maintain autonomous observation stations that we have dotted all over the place – more on that at the time. 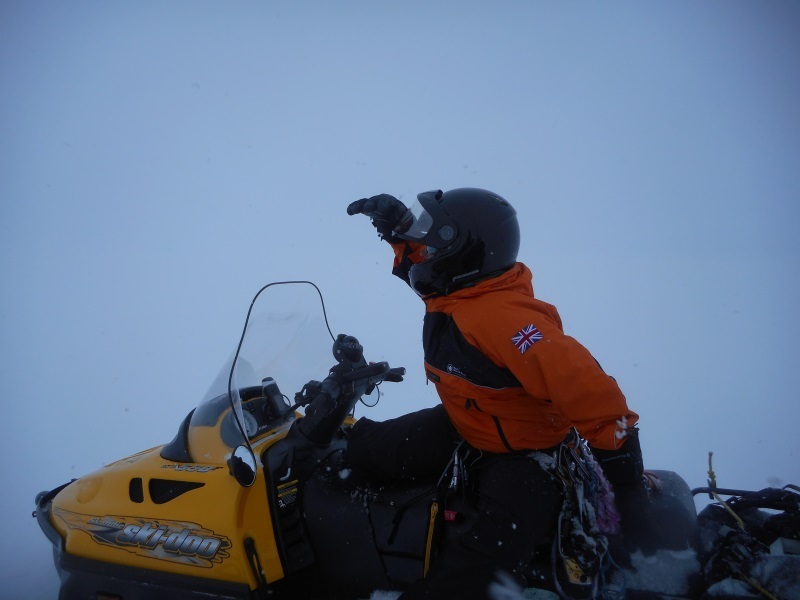 Celine, our atmospheric chemistry specialist also does a load of sampling and chemical tests on the air and the snow that falls. There’s a large area – the Clean Air Sector – where no vehicle or other source of pollution can go. 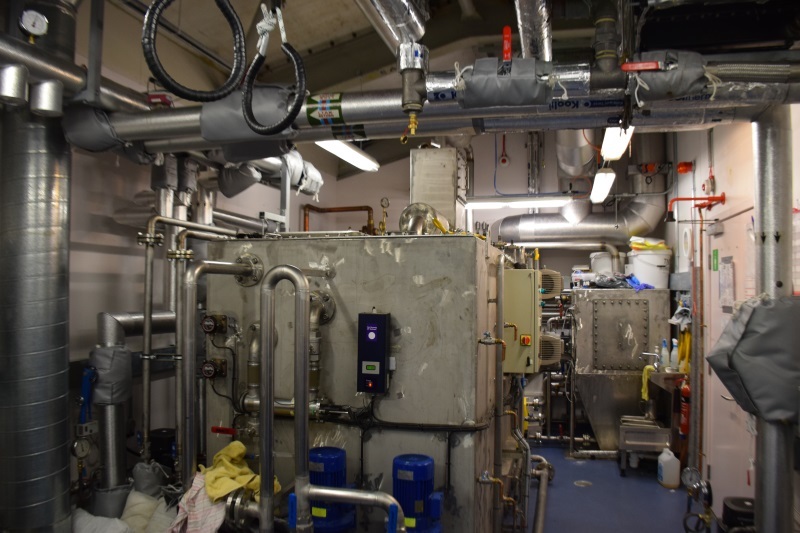 In the middle of it is a small laboratory – CASLAB – where ultra-sensitive spectrometers continually see what the air is made of. It’s sampling like this that shows what, for example, the concentration of greenhouse gases carbon dioxide and methane are – sadly, always on the rise even here, thousands of kilometers from the nearest substantial human activity. Welcome to Halley. I’m Alexander, and I’ll be your tour guide today. I would like to show you the base that is our home and workplace. You have, for some reason, not come in the main entrance and instead have climbed up the fire escape at the far Northern end of the building (far right of photo above!). Unconventional, perhaps, but it does make this tour easier. The base was designed with tour guides in mind, you see, and the architect put all the modules in a long straight fashion. Down the middle of this is the “main corridor”. I am not sure why it is the “main” corridor. We haven’t got any other corridors. As you probably gathered from the view outside as you came in, the base is made of eight independent modules. These can be detached and moved – although not function – separately. These modules are all the same size except the “A” module, where someone clearly pressed the wrong button on a calculator and it’s now twice as big as the others. They painted it bright red, instead of the standard blue, so you can tell which module is the big one. We will start in module B2 (“Bedroom-2“?) at the Northern end and work our way South. 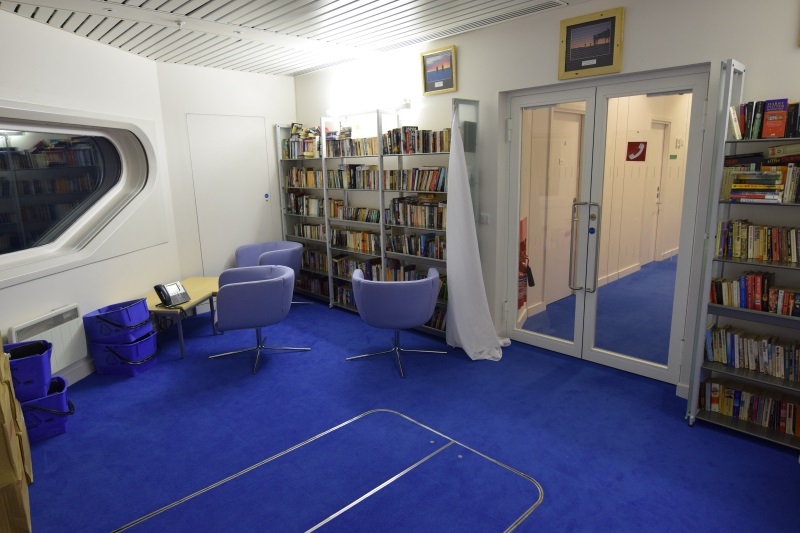 The room we are standing in now is the Quiet Room, ostensibly for reading and peaceful thinking, but in practice is used as as over-sized phonebooth. I guess it still is kind of a Quiet Room as we don’t make many calls from it. It also doubles as a yoga studio. Moving through a set of doors we come to the first of two areas of pitrooms. 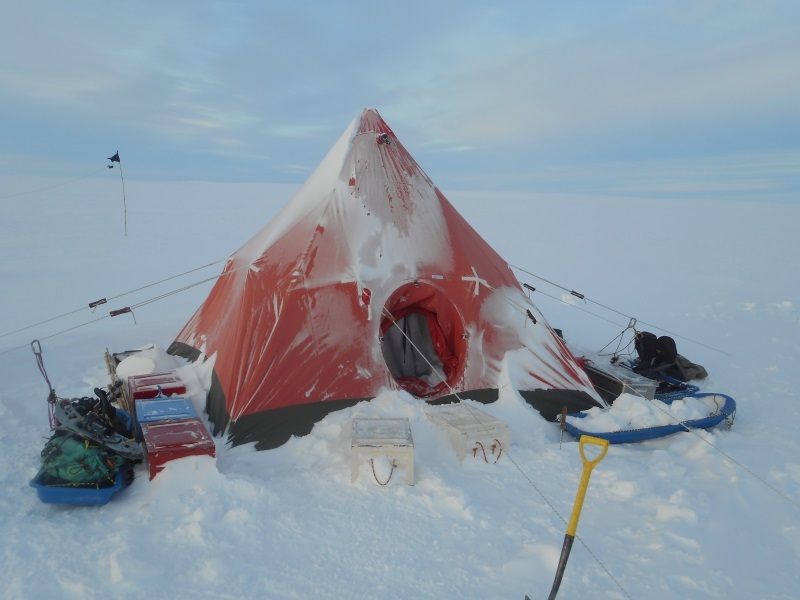 “Pitroom” is a fancy Antarctic term meaning “cabin”, which in turn is a fancy naval term meaning “bedroom”. We have 16 in total, 8 in each of the two “B” modules. 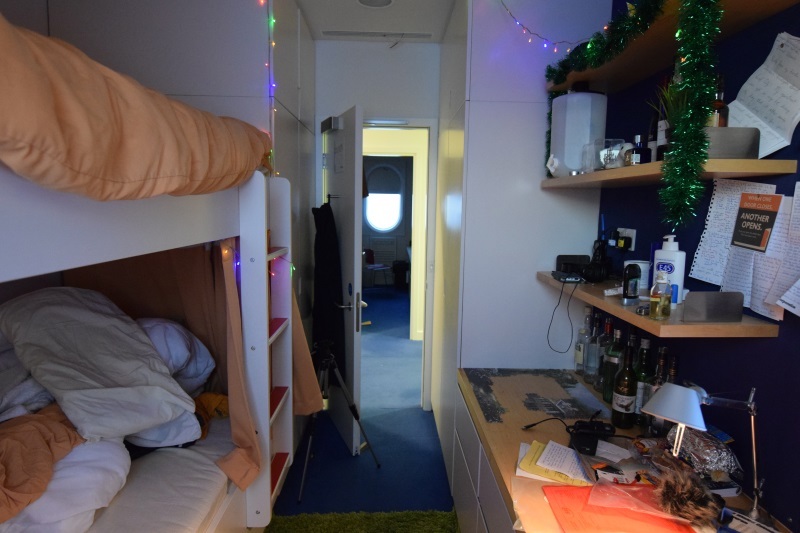 In each pitroom is a bunkbed, a desk and a surprising amount of storage in wardrobes which are surprisingly slammy when you close their doors. In the summer, each of these is occupied by two people, but now in winter we have one each (and some spare!) which is great. They’re tiny – a reflection of the very limited space we have – but intimate and somehow all the space we need. 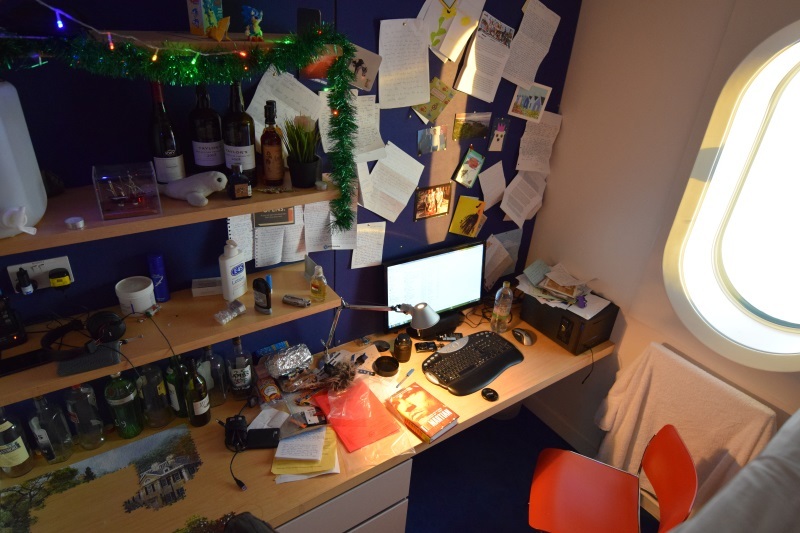 I always feel you need to be particularly tidy to be able to work in a compact space like this, but some of the others seemed to have worked out co-habitation agreements with the God of Mess. I sleep on the top bunk and use the lower one as a sofa and laundry-that-needs-to-be-put-away staging area. I like it. 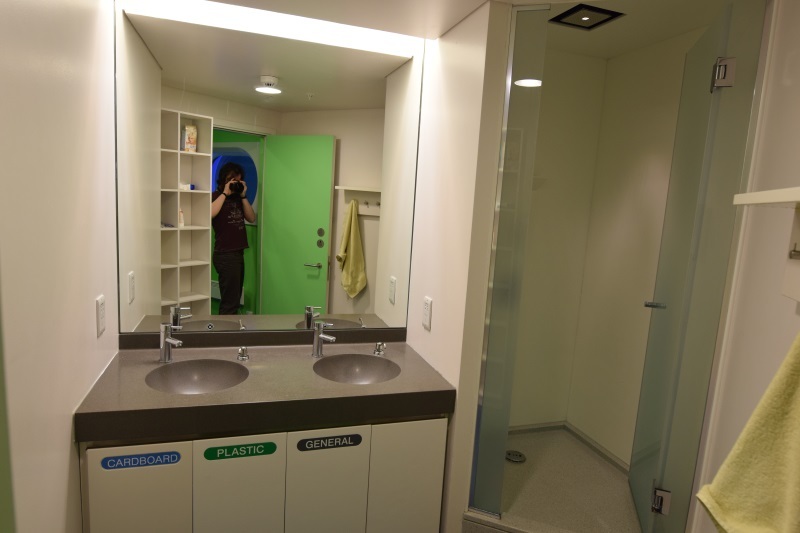 The second bedroom module, B1, doesn’t have a quiet room, instead it has the toilets and showers. Which B module is best divides opinion – I like B1 as it’s mere steps from a bathrooms, others dislike it because other people will be also making those steps to those bathrooms frequently. The bathrooms are nothing to remarkable – similar, in fact to a nice equivalent in Europe. The most noticeable difference, I suppose, is that they get cleaned every other day and that the toilet and sinks drain into a vacuum system – like a toilet in an aeroplane. Moving on through a trellabord (that flexible rubbery enclosure you get between train carriages) we step into the C (“Command“?) module. In here we have all the rooms the architect couldn’t find a place to put anywhere else. First we pass the commander’s office, then the communication office. The latter has all kinds of networking technology and the long-range radio in it. Next we pass the boot room and main entrance. The boot room, unsurprisingly is where we keep out boots and other outdoorwear. In the summer this is a chaotic scene as people come in and out and look for their stuff. On the far side of there is small porch room into which the heavy exterior door swings. I like to think of it as an airlock of sorts. Opposite the bootroom is the surgery and doc’s office. 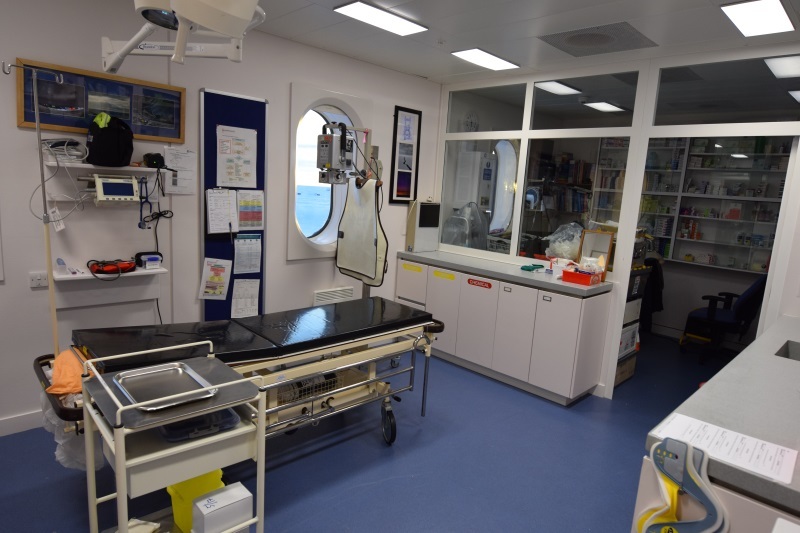 It’s a nice little space, kitted out mainly as an emergency room but also functions as a consulting room, dentist’s chair, X-Ray lab and post office. We’ve not needed to use it in anger much fortunately! There’s another toilet on the left, but otherwise we walk through another trellaboard into the A (“A is the first letter of the Alphabet“?) module. 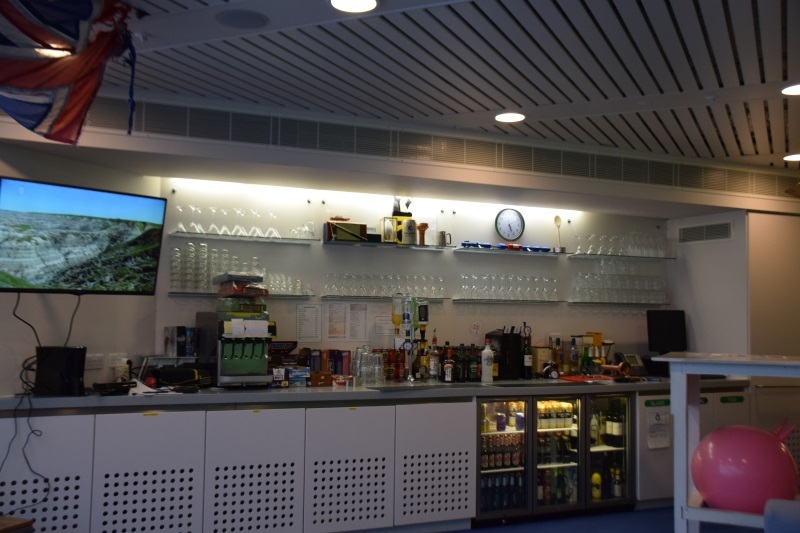 We come into a large room that is a multi-function dining and recreation room. On the near side, we have the food serving areas and the dining table. 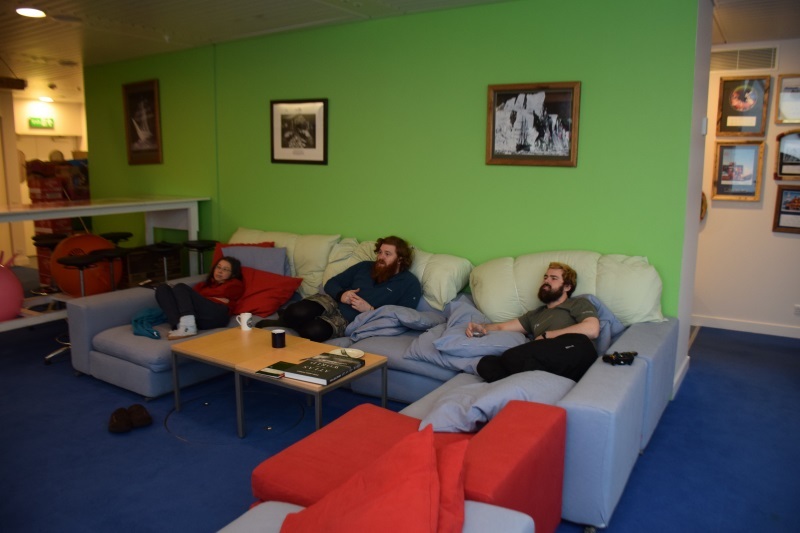 We also got some surplus sofas in and built a coffee area that hardly anyone drinks coffee in. This is where our nice linear tour gets a little complicated. The A module has deviations from the central corridor going left, right and up. To the left we have our large windows, pool table and bar. Those three are watching our favourite form of video: landscapes of the world. To the right, the kitchen and food storage rooms. 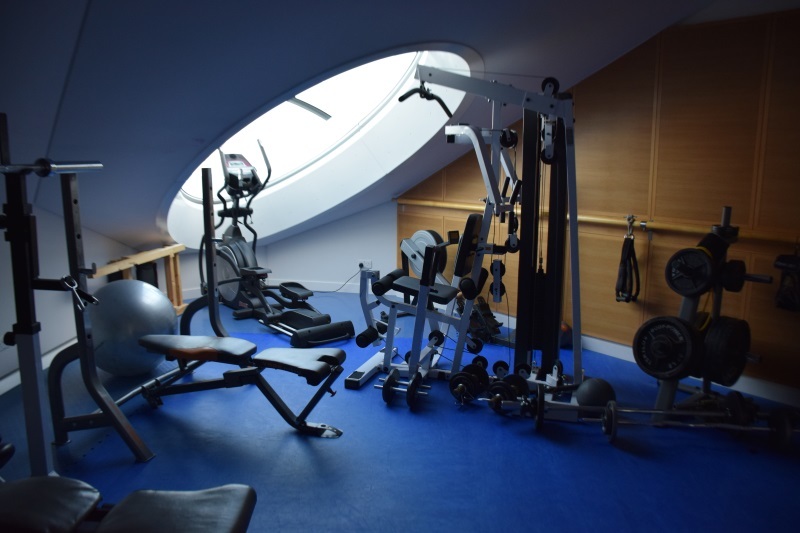 Upstairs, we have a gym, which gets used a lot, and a library/TV room, which doesn’t get used for either. At the moment, it is our flight simulator room. 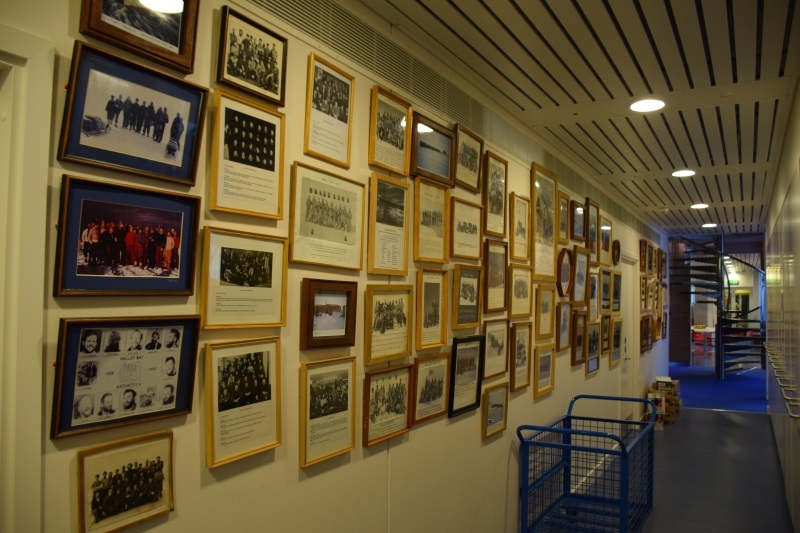 As we continue on our your out of the A module, we have the history wall, the photos of every Halley wintering team for the past 60 years. Seeing all our predecessors is eye-opening. They all had terrible fashion sense. Through the door and we’re on the bridge! This bridge, which is ranked among the top 10 bridges in Antarctica, is primarily a firebreak – in the event of an uncontrolled fire on one side, the other side should survive and is able to operate autonomously. If the North side – the side we just walked through with the kitchen, bar and flight simulator room – was the one that burnt down, we’d have a tough few months until rescue. If the other side burnt down, life wouldn’t be so bad. It spans about 30m, and below it are two water-melt tanks, which we fill with snow and magically get drinking water from. Then we come into E2. E2 is pretty much a mirror image of E1 – having generators, fuel tanks, water tanks. It doesn’t have a fire pump room; instead, it has a sewage treatment plant. The STP is what processes our various liquid-ish wastes into a biologically-inert sludge which is then sent into the onion, as well as a source of many in-jokes. Walking into the next module, H1 (“H as in ‘I like the letter H‘”), which is the first of the science modules. 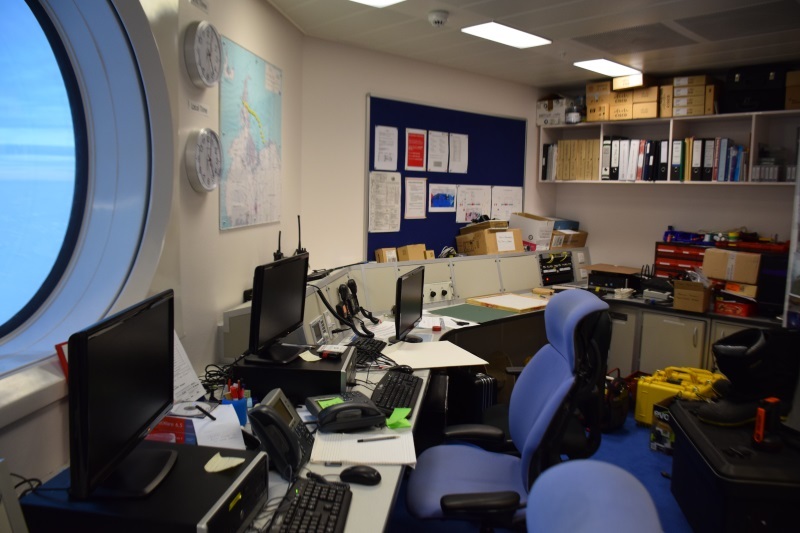 This is dominated by an open-plan office that the science team – and I – work in. 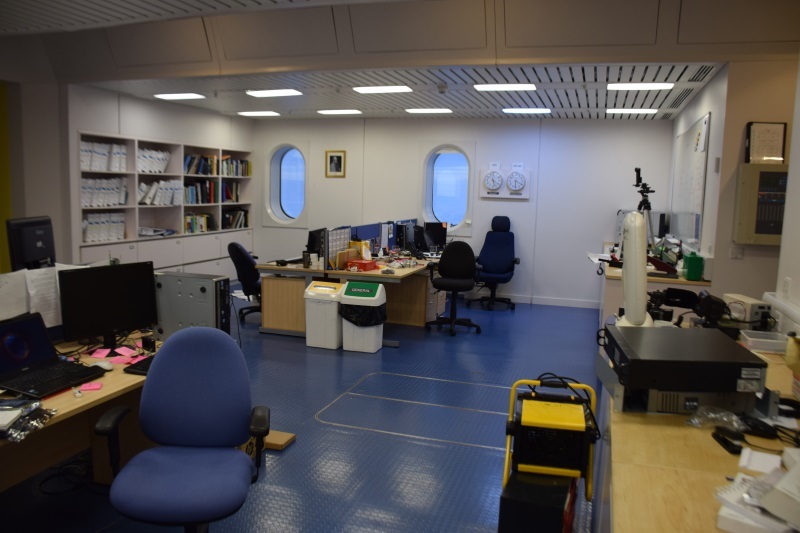 At the moment it’s pretty spacious, with only 6 of the 12 workstations occupied – but come summer it gets pretty busy. 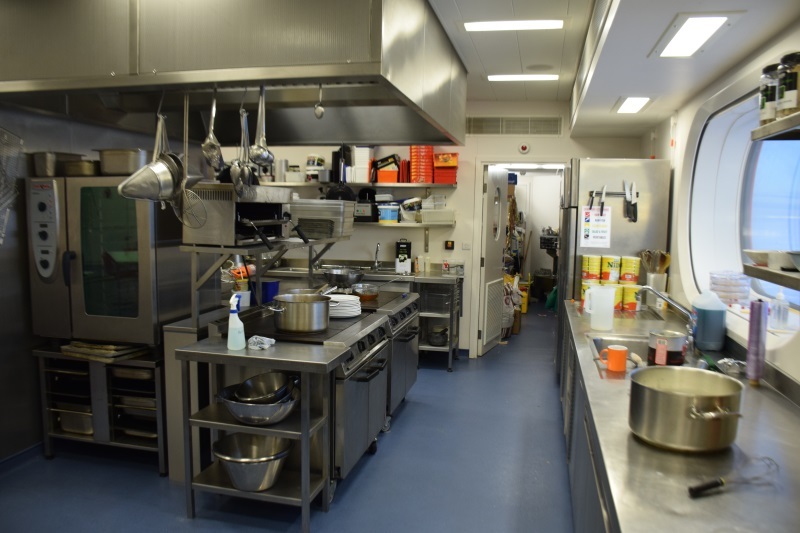 We also have in this module our biomedical science lab, wet lab, balloon tracking room and another bootroom/external exit. Please note, if any tour guests need the toilet, there is one available in this module. There is not another toilet for some 1500km, so if you need to go, do so now. Our tour will is nearly at an end. 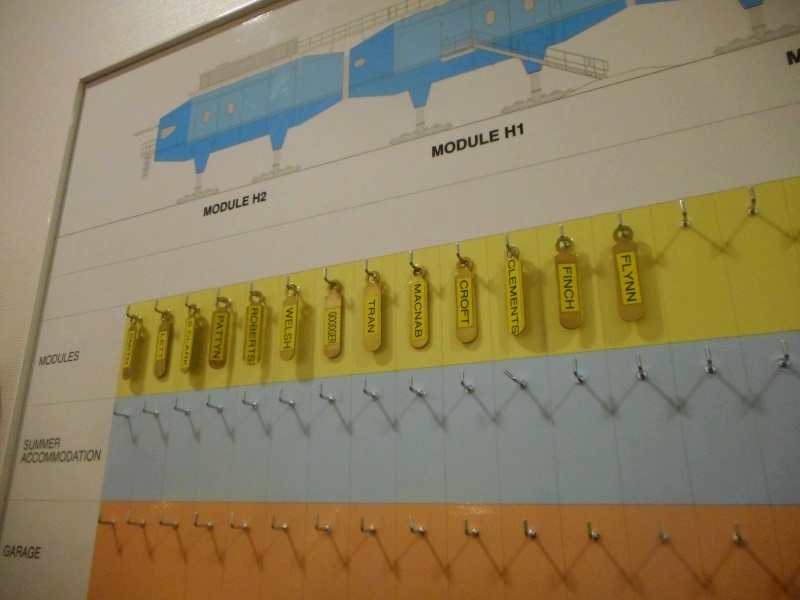 We step into H2 (“I really like the letter ‘H’“) module, which is the second science module and the Southernmost of the base. In here, we find our equipment storage room, our electronics lab (where we tend store stuff liberally), our mechanical workshop (also used for storage), field preparation room (lots of things here being stored here) and lower meterological observation (at the moment used for storing things). Yeah – we have a lot of things being stored at the moment – most of which was supposed to be shipped out at the end of last season but wasn’t because of the whole ship-not-able-to-get-here thing. 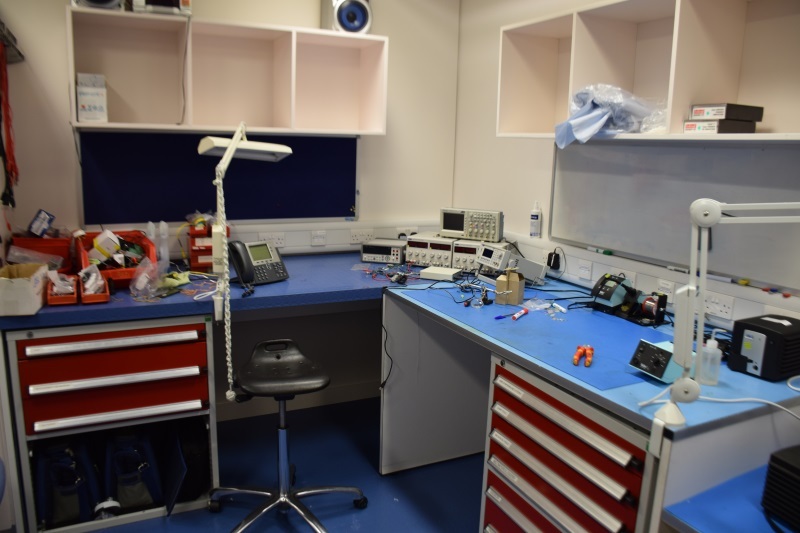 The electronics lab is my main domain, where I (when not storing things) work to repair and prototype scientific experiments. It’s pretty well equipped and organised. Very nice place to have. Most of my work is computer-based though, so I spend most of my time in the science office or in the cabooses (the science “sheds” outside). The field preparation room is probably my favourite room on base. 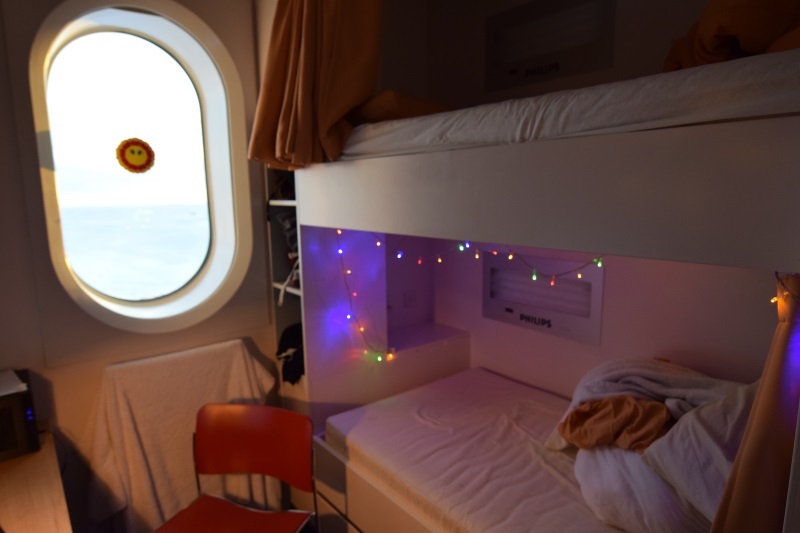 It has great windows looking out over the Southern continent, a balcony and the best mood lighting on base. 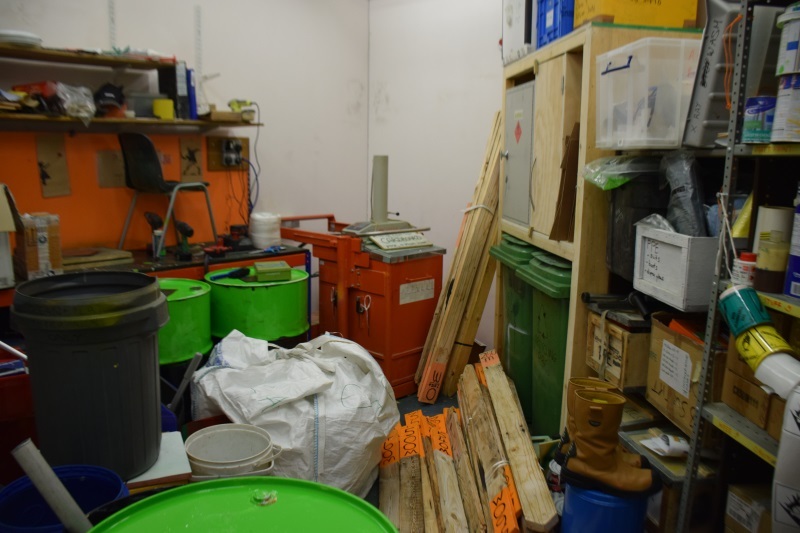 Ostensibly it’s used to prepare outdoor equipment and lower it via a winch to the outside, but in practice is mainly used for storage, biomedical research stuff and as a one-time bar. 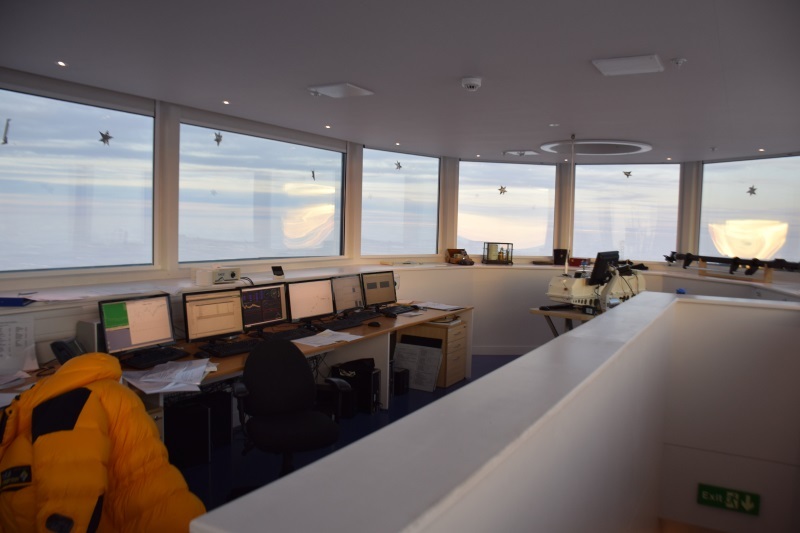 In the lower meteorological room there’s a staircase up to the observatory (“upper obs”), where the duty meteorologist records the weather. It’s got the best view on station due to its elevated position and 345º windows. It’s quiet and has its own roof garden attached. It’s also Celine’s spare bedroom as she occasionally needs to work though the night here. Oh, we also have a server room in this module – used to hold servers and for storage. 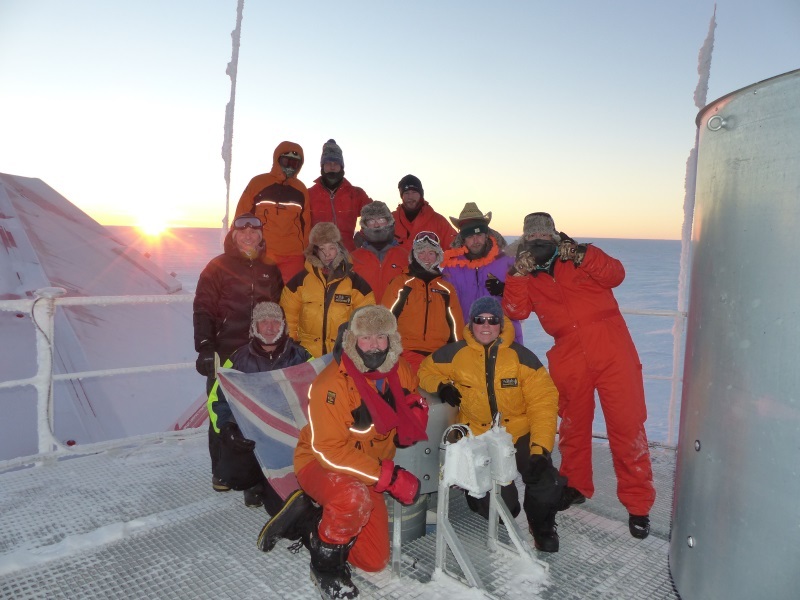 That concludes the tour of the new Halley base. I hope you enjoyed it – tips welcome. To exit, either go back to the main door in H1, or go down the emergency ladder on the field prep room balcony. Sundown. 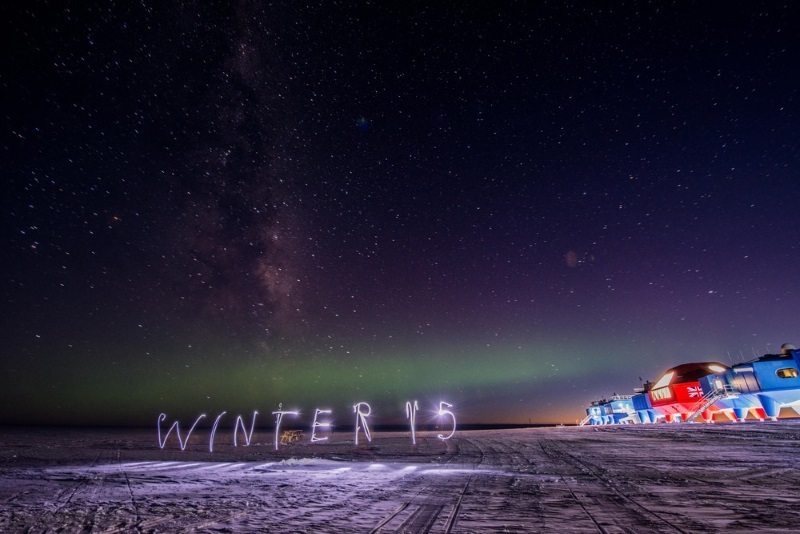 One of three major events of the winter experience. This, as you may have guessed from the name, is the time when the sun slips below the horizon for the last time. It is the symbolic start of the deep winter (although some say the departure of the last ship/aircraft is more iconic). 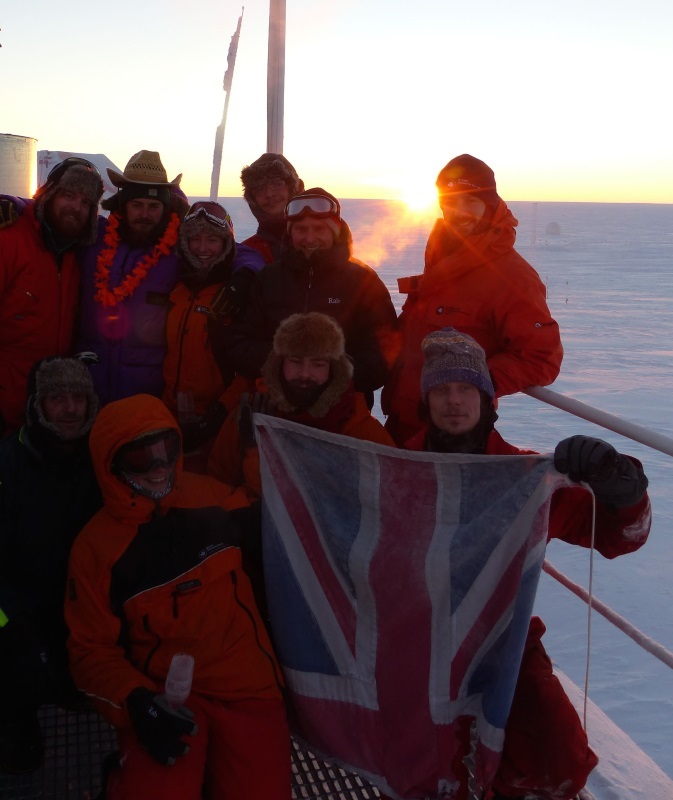 It is also the moment where the base flag, tattered after enduring Antarctic winds for the previous 8 months, is lowered. We mark the poignant moment with choice words given by the eldest member of the crew, a flute of champagne and a sacrifice a squirrel to the Sun God to please it so it will send the sun back to us after our 105 days of darkness. This year, unfortunately, we had no squirrel at hand, so I hope the Sun God will be suitable impressed with the poem Ian wrote and delivered. 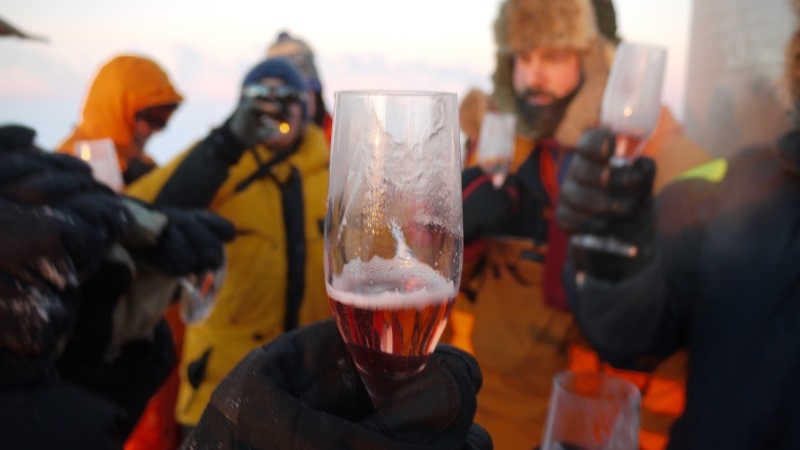 With an outside temperature of -32C, enjoying the champagne had to be a brisk process. We took advantage of the last bit of direct light to go out and play a game of rounders. Despite some wildly different interpretations of the rules of this game, it was great fun. Just before St Patrick’s Day, there was a large solar storm. The largest for years. The Sun sneezed, and a few hours later Earth was bathed in high-energy solar particles. So far, this sounds like the opening scene of a poor science fiction/disaster movie. Most of this particle shower was absorbed by the Earth’s magnetic shield, but here near the poles, where the magnetic field “comes down” into the planet, these particles reach the atmosphere. 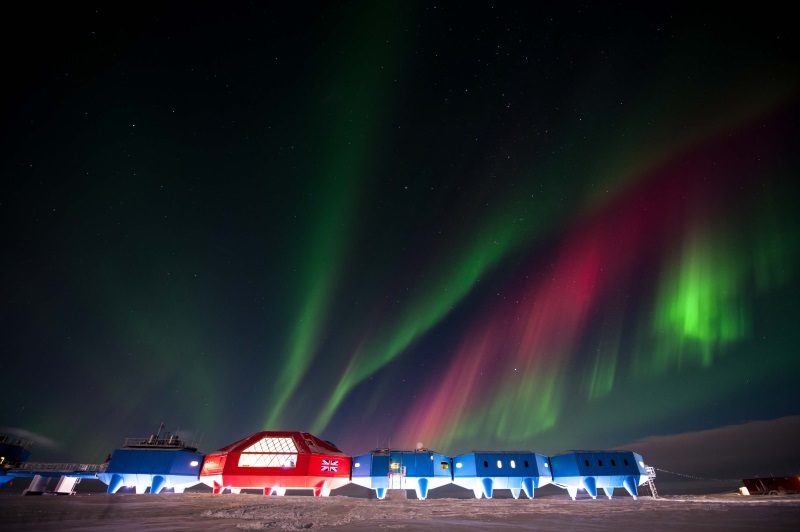 When they do, they strike atoms in the high atmosphere, making them glow brilliantly, and we are treated to nature’s interpretation of neon lighting – an aurora. The first time we saw it, it was subtle. It resembled a cloud – a faint whiteness on the darkness of the night sky. Looking at it for a while, letting our eyes adjust, we concluded that you don’t get white clouds in the middle of the night, because it’s night and dark. This was something else, and we could make out colour – a tint of green. It was vague but it was there. Wake most of the base and get them out of their warm beds. Get us to voluntarily stand outside in the glacial cold for an hour or more. They’re hard to describe. At first glance they are like translucent, coloured clouds. Then you notice their form – they are ribbons, mostly, snaking across the sky. Many of them look like they are two dimensional structures, bands with no width. They appear static, but – much like clouds – if you look away and then back again they seem to have changed somehow. This change is usually slow and unnoticeable, but occasionally you get pulses of activity, a dance, where they change in the blink of an eye. Of course, they do so entirely silently. It’s eerie how silent they are. They certainly deserve an orchestra, or at very least some Explosions in the Sky. To richen the experience, on the first of these nights while we were lying in the snow just outside base, we also saw numerous satellites whisking across the sky, an Iridium flare, a meteor and a galaxy. 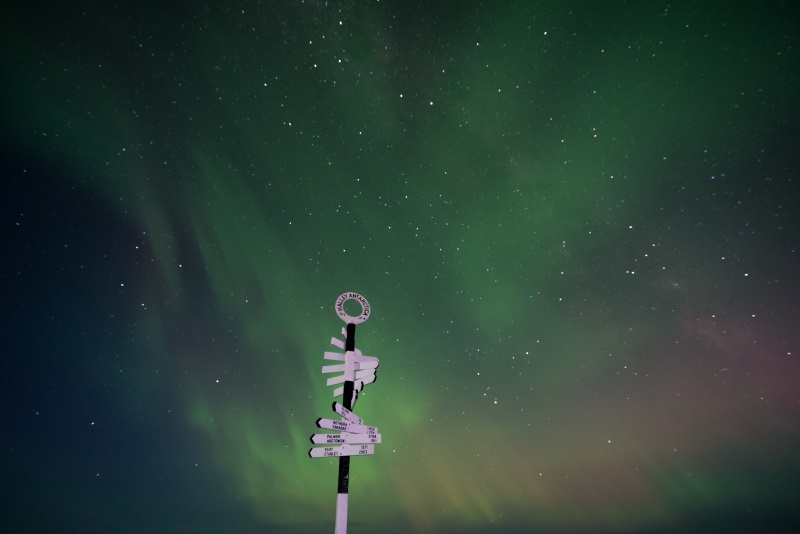 We haven’t seen any more major displays since but they are happening – we can see on our instruments that are watching the sky that there is magnetic and ionospheric disruption. These occur when we sleep or when cloud is abundant. But certainly many more performances are scheduled, especially that since tomorrow we will see our last sunset for some months. During our time here, we get three main holidays. One is a week off to celebrate midwinter’s in June, the other two, at the very start and the end of our winter, are week-long field trips. In groups of three or four, we head out and spend a few days camping in an area away from base of our choice. We go in staggered weeks to make sure we have enough people to run the base. My week, which was shared with chef Sarah and doctor Nathalie, went to a popular area for such trips known as the Hinge Zone. 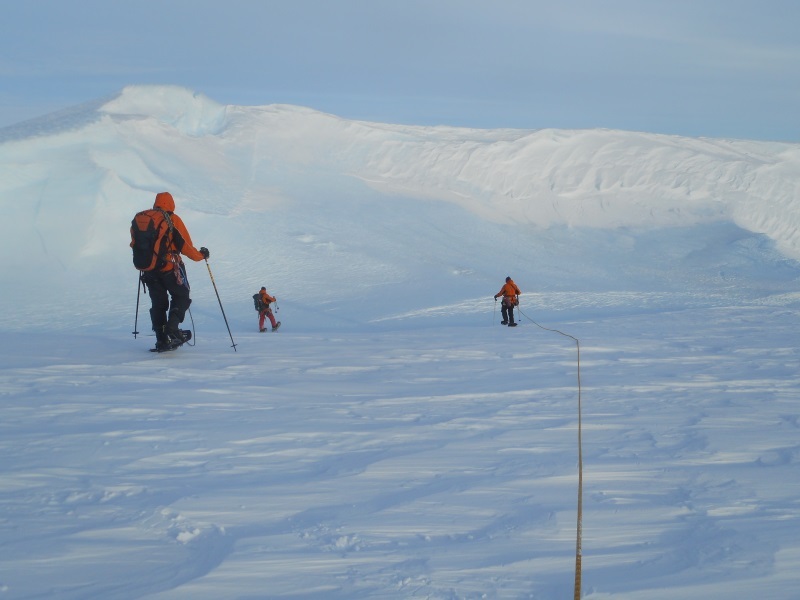 We were guided by veteran field assistant Ian, who has previously wintered at Halley (the only one of our crew to do so). So, on to the snowmobiles and off we went! 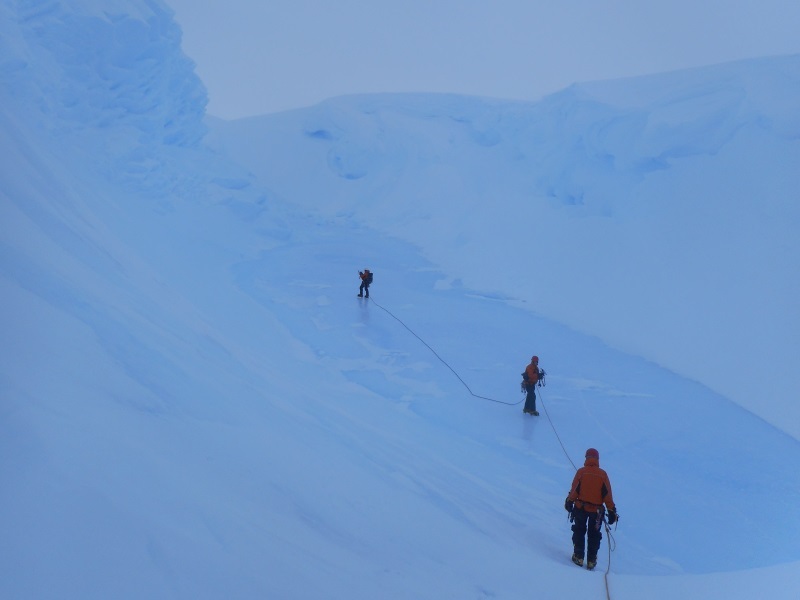 After a couple hours’ trip heading inland towards the continent, the flat uniform ice was broken up by features – large crevasses, cliffs and holes. These were impressive, glistening in the sun, and are created as the ice cap slowly slides off the landmass under us and onto the sea to become the ice shelf. 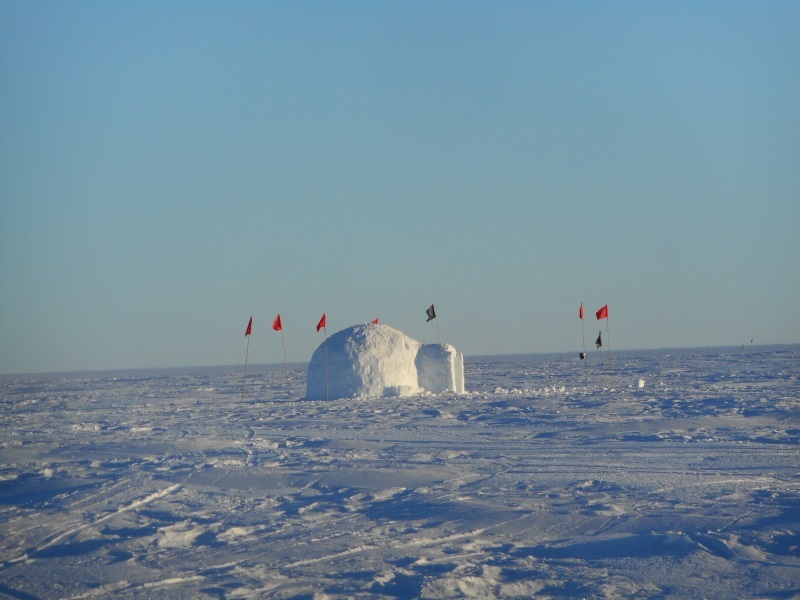 The ice shelf (on which Halley sits) is affected by small tides, and the flex point is around here – hence Hinge Zone. This movement, as well the the sudden change in sub-glacial topography, creates these features and some rolling “hills” of ice. 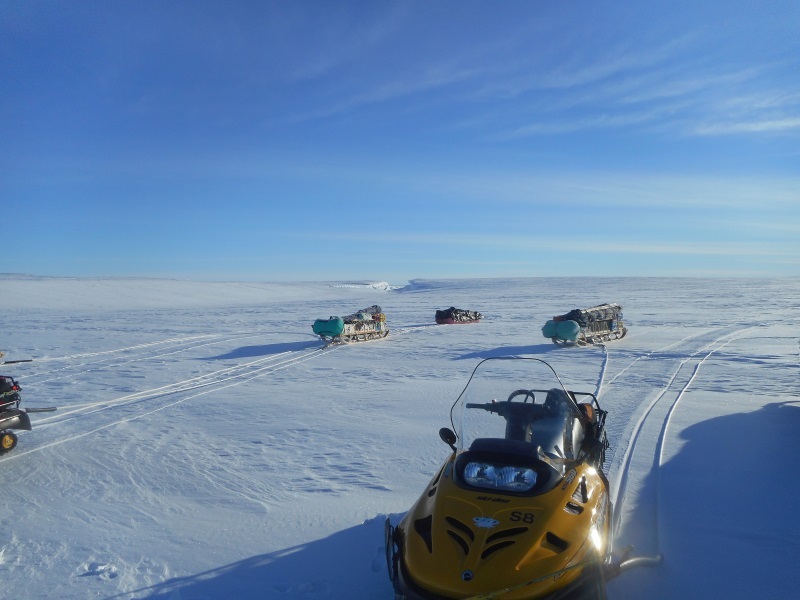 Our kit was hauled with us in 5 towed sledges – 2 of which were entirely spare supplies. We had enough stuff in total to accommodate ten people, and food enough to last us a month. We arrived at Aladdin’s Cave, the local tourist hotspot (by local standards), and set up camp. The sun had been out, providing excellent contrast and visibility for our drive, but it started to cloud over once we had our tents in place. In previous years, there has been an actual cave at Aladdin’s, but that has long since closed up and now it is a hard-to-describe geometrical feature. I suppose it is best described as a small ice canyon or gorge, with a frozen lake in the middle. Very cool to see. We had a wander around in there before we retired back to the tents for the evening. The first night was particularly interesting as we had some high winds that night. The tent rattled and flapped aggressively but I slept excellently throughout it all. You tend to sleep well in the field, it seems, as long as you have completely emptied your bladder before you get in your sleeping bag. It is a personal aim of mine not to use our issued pee bottle in my time here.. But the better part was a little bit further. Roped together into Alpine pairs, we trudged into the feature and the landscape changed dramatically. It was a complex, undulating, irregular landscape quite unlike anything anywhere. While easy enough to penetrate and around walk in (thanks, crampons!)  is was alien and desolate. A low, cold sun and a moderate wind that whipped up drifting snow across the strange shapes gave the distinct impression we were somewhere very unusual and special. It felt more like Antarctica than my first day at the base did. 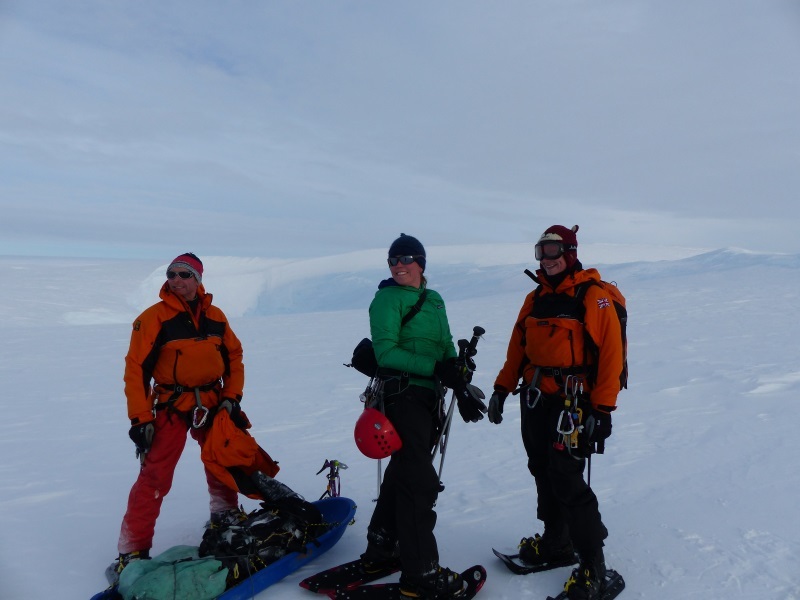 The next day, the visibility was very poor and we struggled to get anywhere new. We instead went to a well-known local landmark, Stoney Berg. This is a large chunk of ice that has become trapped in the ice. Ok, that may not be quite so unusual-sounding, I suppose. 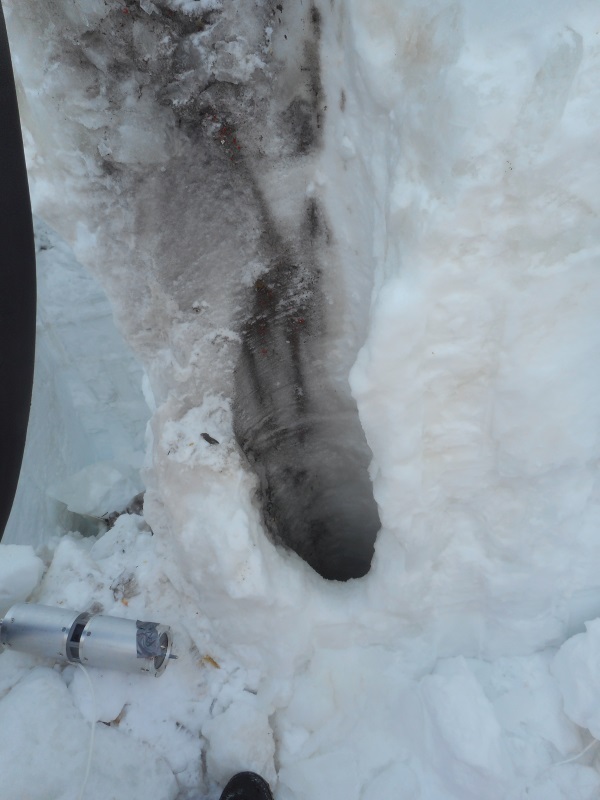 What is evidently peculiar is that this ice mound, sticking out of the flat chasm floor, has stones on it. Small boulders sticking out. This, again, may not be unusual to you, but here it’s very strange. We have not seen rock in months! Nothing but ice around here! There’s no obvious way that these rocks could have got here, but current thinking is that this chunk of ice is actually an iceberg that flipped over at some point, scraping the seabed as it did so, and lifted some rocks up with it. Then it got frozen into its current position. Unusual. However, not being a major geology fanatic ,I satisfied with the observation that they were “probably granite”, we moved on to the highlight of the day: ice climbing! 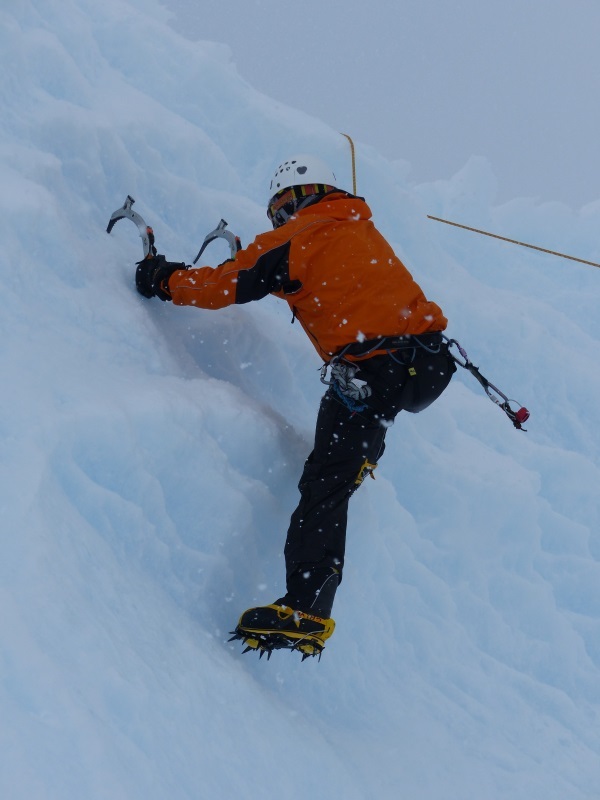 We spent a few hours laying ice anchors, abseiling down an ice cliff and then climbing back up. Good fun. I like ice climbing. Once you get the knack of it it’s quite a bit easier than regular climbing, but you still get a good sense of satisfaction when you make it to the top. While preparing for a field trip today, I noticed something. 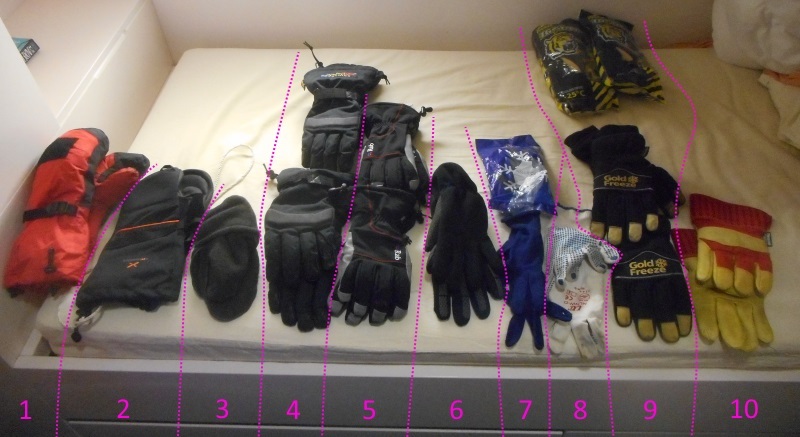 I have a higher-than average number of gloves. 19 pairs, to be specific, of 11 different types. All issued by BAS for a purpose! Down stuff gloves – tiny lightweight but very warm gloves carried when off base as a backup in case our main gloves get blown away, buried in snow or wet ..
Field mitts – heavy duty mitts for wearing out in the field. You’d wear these when skiing or walking outdoors off base. Optional fleece inner for the mitts. Winter field gloves when you’re out on a cold winter day but need more dexterity than the mitts offer, perhaps because you’re ice climbing or something. Two pairs of these. Summer field gloves – my favourites so far. I use these whenever I’m going outside and now expecting to work on anything messy. Comfy – similar to normal ski gloves. Two pairs of these. Thinnies #1. These are thinner gloves we car wear under the mitts or winter gloves for extra warmth, and to allow us to take of the main gloves to do fiddly work without needing to expose skin. I’ve not used these much yet but will need to soon. Thinnies #2 – a lighter version of 6. I’ve not made much use of these since it’s not been cold enough for them, and because they have a habit of siding with the outer glove over my hands when I take them off. Electrical gloves – for handling electrostatically sensitive items, or delicate items that don’t like getting grease fingerprints on them. An excellent choice for the the discerning criminal looking to evade detection. The Gold Freezes have a mixed reputation here. Some people say they fall to bits quickly and aren’t very warm. Those people are right. However, we were issued with four pairs of them, so they there always tends to be a pair handy when you go outside quickly. As a result they get more use than any other glove type. Fuelling and dirty work gloves. Fortunately, my job description doesn’t usually involve really messy stuff (with one notable exception..) so these look fairly clean still. Some of my teammates, however, aren’t so lucky and their pairs of these are a distinct shade of black. Not shown are the bearpaws, another pair of oversized mitts with fur on the back side. We will use these for skidoo riding in the coldest weather when we need vast amounts of insulation. You can’t really move your hands in these, though. 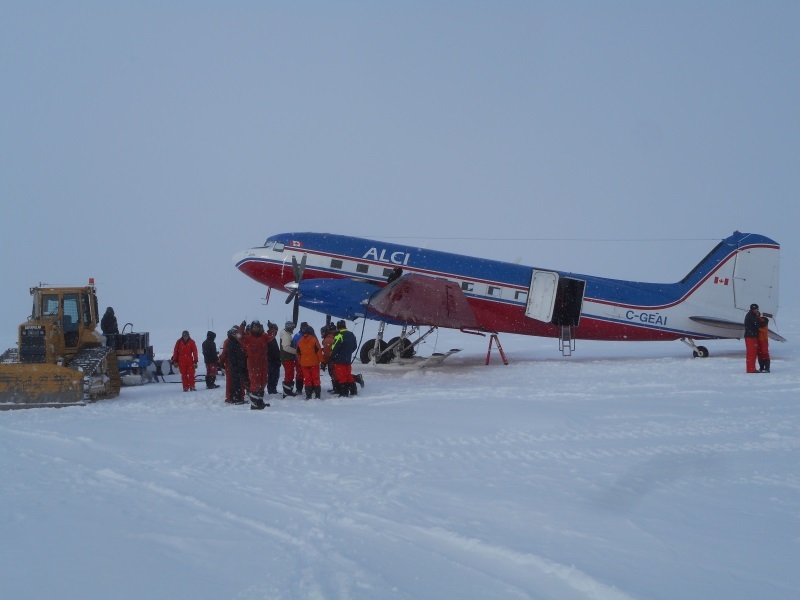 Earlier today the last aircraft left Halley, taking the last of the summer staff out to our other Antarctic base, Rothera, on the peninsula. Fun fact: this particular aircraft built in WWII and has crashed once since then. It’s looking spendid today, and evidently the bungee cords attached to the tail control surfaces work great. There wasn’t supposed to be an aircraft here today. 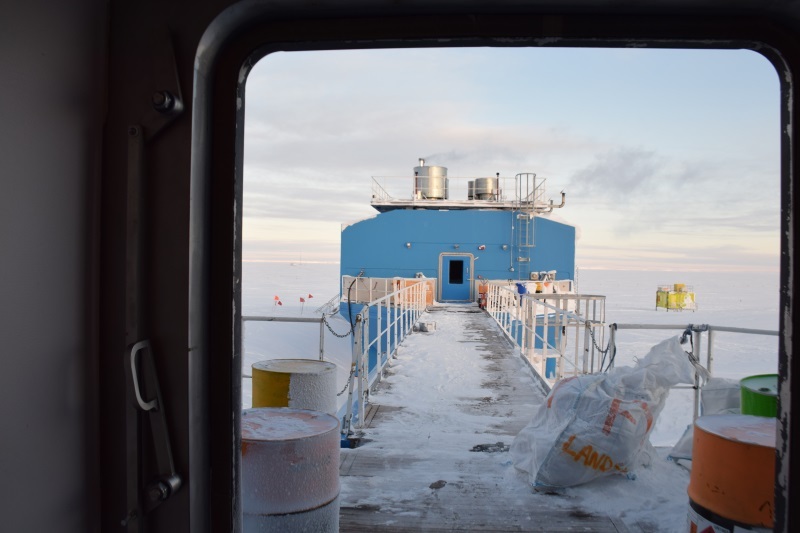 The same ship I came in, the Ernest Shackleton, was scheduled to return to Halley to bring us winter cargo, fuel, and take the summer staff out. It is currently bobbing around in the South Atlantic just off the coast, but is unable to get in to the relief point. The ice is now too thick and growing, and it can’t risk getting stuck at this time of year. 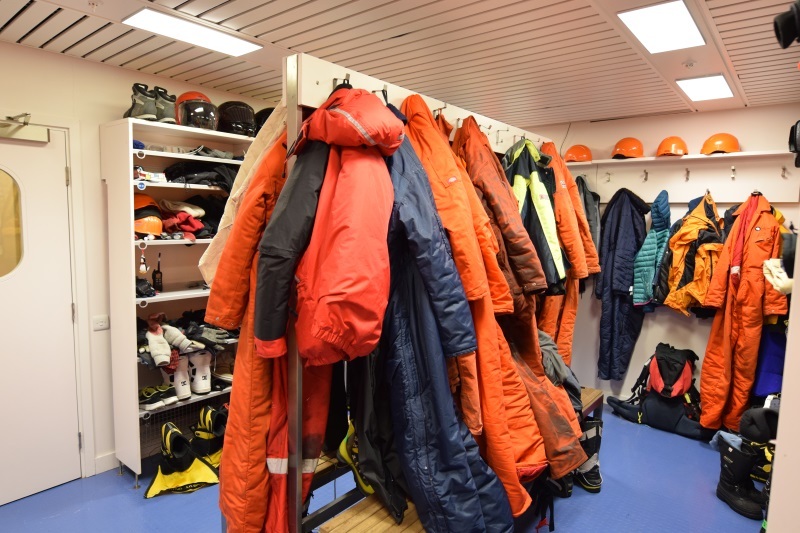 So, non-wintering staff are being evacuated to Rothera before the weather turns too foul for air operations. 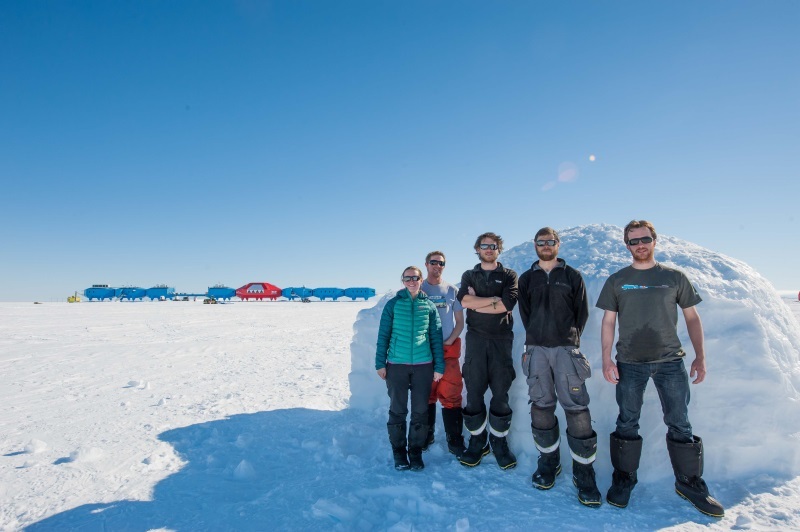 For some, quite the adventure: it’s a scenic flight to Rothera, and from there they’ll be taken to Rio de Janerio on the HMS Protector, a navy vessel that happens to be in the area. We won’t get our resupply cargo, but this isn’t the end of the world: we have enough contigency here to sustain us until its next visit in December. The Baslers, on their way here, brought other essentials for our safe winter such as fresh food and gin. The worst loss to us is all our mail and any last-minute things we’d ordered which now will not make it here. After a few goodbyes with those we’ve lived, worked and played with over the last two months, this last plane left, quickly disappearing into the whiteness. The 13 of us are the only people for hundreds of kilometers, and thousands from the nearest thing you might call civilisation. It’ll stay like this until the first aircraft can get back to us in October or November. We’re by ourselves now. spiral of narrowing blocks to the top and a raised floor. It went together very easily at first. nervous that the blocks wouldn’t stay put. Turns out that fear was unfounded. Gravity doesn’t seem to apply in igloos, and the blocks stayed in their precarious places solidly. Mostly. something I can tick off the bucket list as soon as I make such a list. people comfortably inside for a victory beer. Once built, we had to, of course, make use of it. So, we grabbed some sleeping kit and spent a night in there. 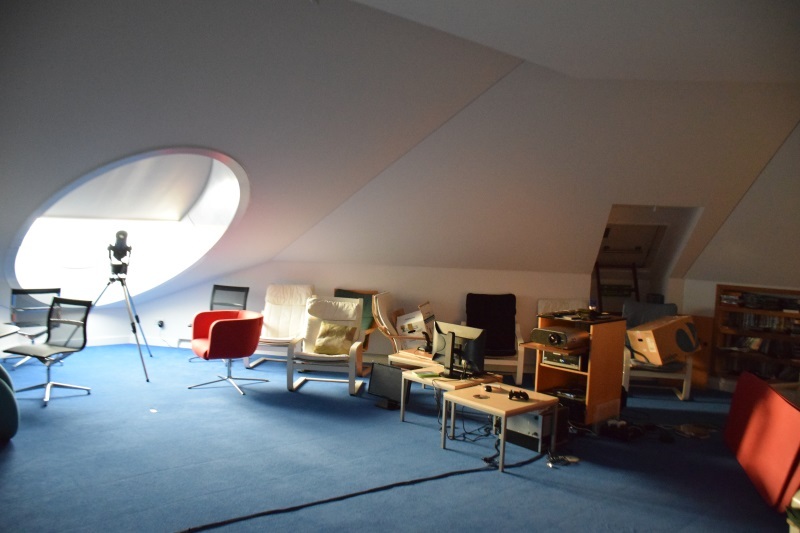 Plenty warm, but surreally bright – the light permeates the walls and at the time we had solid 24 hour sunlight which meant it was like sleeping all night in a well illuminated room. The joins between the blocks were a little bit brighter, giving a neat Tron-like pattern. 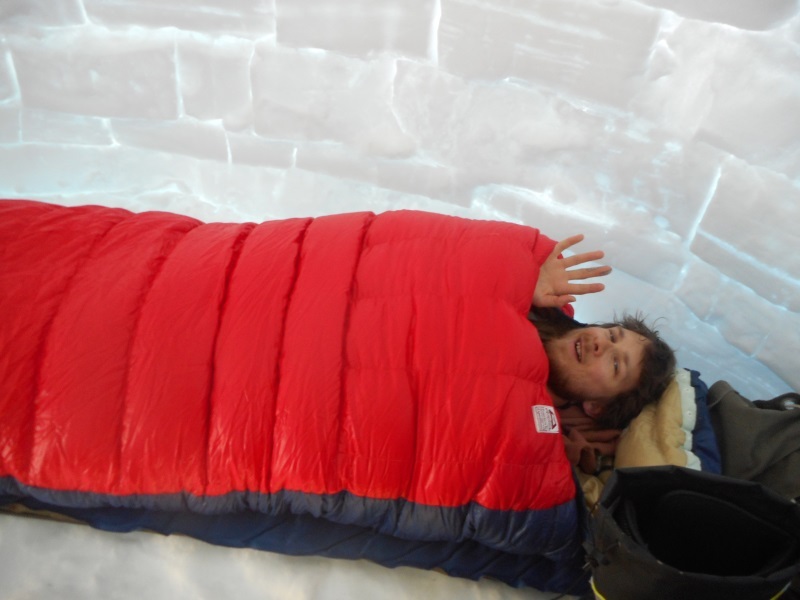 Flash in his sleeping bag. Fun fact for my camping friends: that’s a one-season sleeping bag, where the one season is summer. Recently, we looked out of our window at the ever-earlier evening sun. 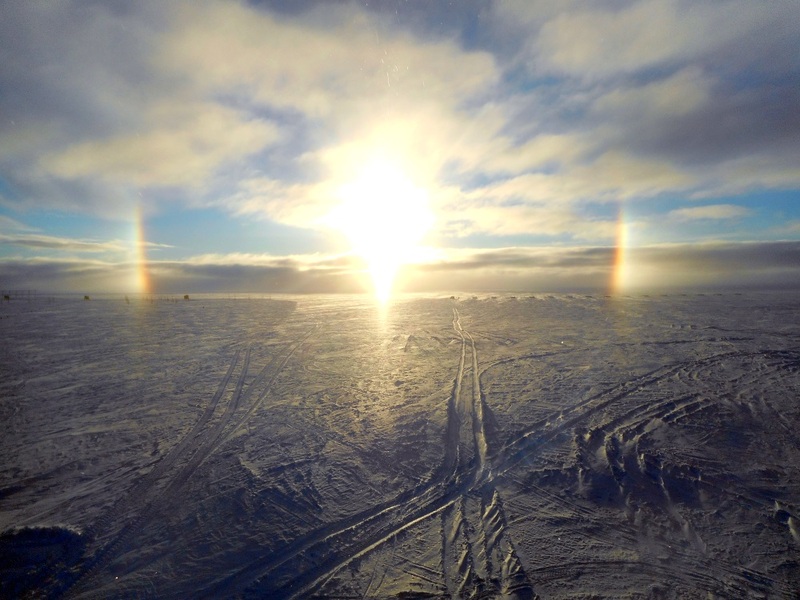 Parhelia, or Sundogs. It is similar to a rainbow anywhere else, except that we don’t have rain here, ever. This is caused by ice crystals in the sky – an ice-bow. Although not visible to the camera, the same ice that caused it was also visible at ground level, sparkling as it was carried by the wind as diamond dust. A few of the people who have emailed me lately (thanks!) have expressed concern that everything I’m doing out here seems to be fun and games, with trips and flights and ship cruises. While these are fun (and there are games), I am also have a job to do. Over the winter I’ll detail a few of the things I’m looking after but today I wanted to share a bit of the glamorous work I do here. Yup, into a hole in the snow. 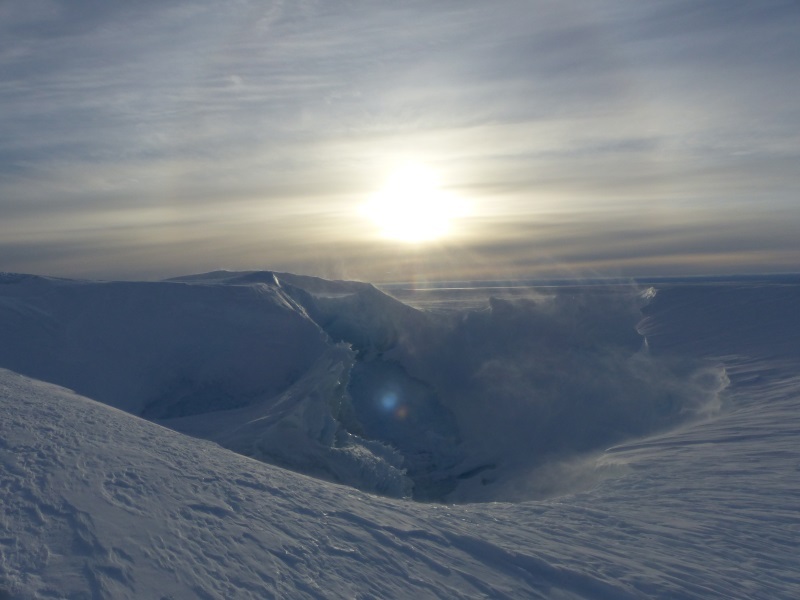 The hot liquid poors directly into the iceshelf, melting its way down tens of metres. At some point, it stops and goes sideways, melting itelf a cavern we can an “onion” (owing to its supposed shape). We didn’t know much, however, about what it was like in this onion, so a specialised camera with a LIDAR attached was sent this summer to investigate it. 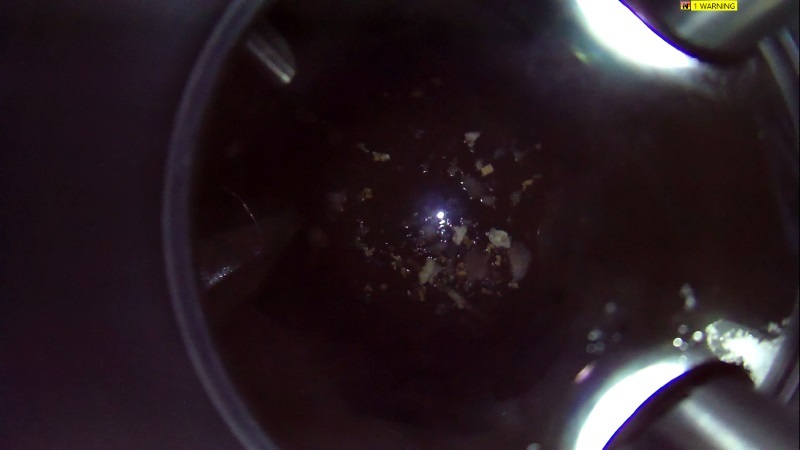 I was assigned the Preliminary Onion Observation Project effort and one morning we sent the camera into the hole. This particular onion is done now. It has been sealed and a new one started. This one will freeze, compact, and one day will drift out to sea in an iceberg.